ONE in five MLAs who will finish the current five-year Assembly term were not elected into position by the public. The impending retirement and replacement of First Minister and east Belfast MLA Peter Robinson means that 22 of the 108 MLAs (20.4%) at Stormont will have been appointed by their parties and not the electorate. Substitute MLAs have now been appointed in 12 of the 18 Assembly constituencies, with four of the current six south Belfast Assembly members unelected. Legislation introduced in 2010 allows parties to replace outgoing Assembly members with a replacement politician of their choice – but in the past the practice has been controversial. Today Detail Data gathers information on the replacement of MLAs and multiple changes to Stormont’s ministerial posts in the current Assembly term, as well as details of replacements at local council level. The substitution mechanism was introduced to eliminate arguments caused by the old co-option system and to eradicate by-election costs of up to £215,000 per poll. In addition to MLA replacements there have been major changes in who sits at the Executive table, with just five of the 15 ministerial seats occupied by the same representative for the duration of the current Assembly term. The key departments of health and finance have seen three ministers each in the current Assembly term, whilst the departments of enterprise, environment, social development, regional development, as well as the two Junior Ministries, have also seen changes. In addition to the permanent replacement of Peter Robinson when he leaves office at the end of the year, the First Minister’s role was previously held by Arlene Foster on an acting basis (Sept-Oct 2015), when the DUP were rotating ministers during the Stormont talks process. John O’Dowd also temporarily stood in for deputy First Minister Martin McGuinness during the latter’s Irish Presidential election candidacy in 2011. This means only the departments of agriculture, culture, education, employment & learning and justice have had the same minister for the duration of the current term. Such changes are largely regarded as internal party matters, while the civil service is seen to provide continuity between ministerial appointments. But the changes can have an impact on the public according to some groups lobbying the Assembly. Anita Flanagan of Fermanagh Community Transport (FCT) said her organisation raised the issue of rural transport with the former Department for Regional Development Minister Danny Kennedy. “We had met with Danny Kennedy a number of times and had built up a relationship with him,” she said. “He had been to our office, he met with our users and he had built up a knowledge of what we do. “Community Transport is only a small part of the Regional Development minister’s budget – when you look at things like Translink. But we got it brought up his agenda through engagement and asking questions. We met him twice in July and at the end of the second meeting felt that we were getting somewhere. “There is now a new minister and that minister needs to learn her post which takes time. So every time you have a new minister you have to start from scratch which is difficult – especially when there are cuts to be made. To view all MLA changes so far in the current Assembly term click here. There are multiple reasons for the large turnover of MLAs, with the eradication of double jobbing among political representatives one of the main drivers. 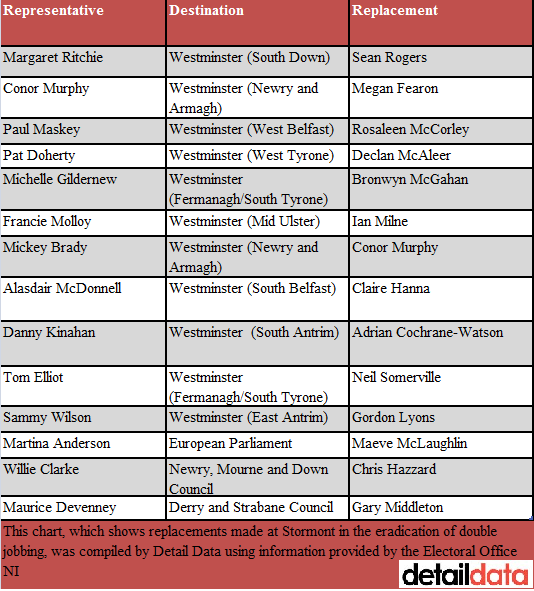 The table below shows how this has impacted upon representation, with 14 members leaving Stormont in the current Assembly term in favour of seats in Westminster, Brussels or local councils. A number of substitutions at Stormont have also been as a result of the death or illness of a sitting member. For example, Claire Sugden, who had previously replaced David McClarty on Coleraine council, later replaced the Independent MLA in Stormont following his death in 2014. Sinn Féin's West Belfast MLA Sue Ramsey, who had to step down for health reasons, was replaced by sitting South Belfast MLA Alex Maskey, who in turn was replaced by Belfast City Councillor Máirtín Ó Muilleoir, who in turn was replaced in City Hall by Geraldine McAteer. The Assembly term also saw Megan Fearon replace Newry and Armagh MLA Conor Murphy, who stepped down from the Assembly after committing to his role as MP. Mr Murphy then decided not to stand for re-election to Westminster in 2015 and was substituted into the Assembly seat held by party colleague Mickey Brady, who had been elected to replace him in the House of Commons. The Foyle seat won by William Hay for the DUP in 2011 has been held by three representatives in the current term, with Maurice Devenney initially substituted to replace the former Assembly speaker in October 2014. 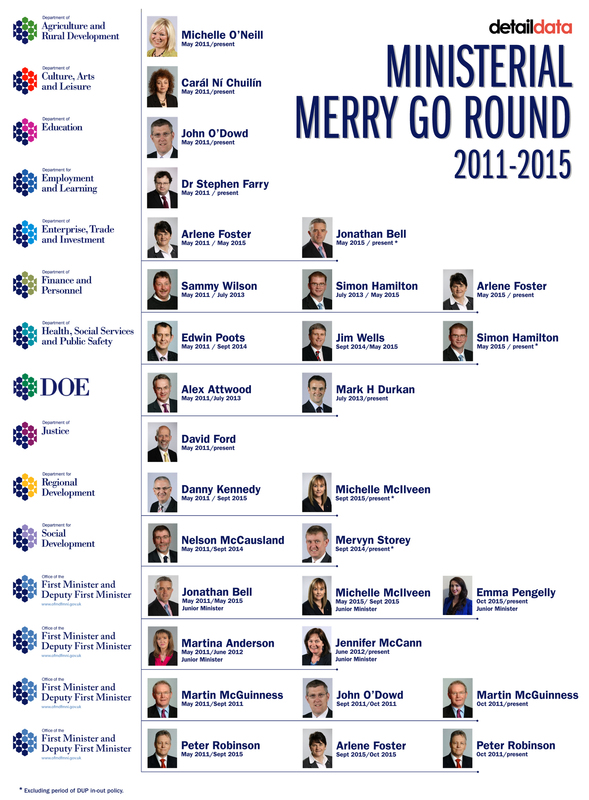 Mr Devenney then stepped down just five months later, with Gary Middleton being appointed to the seat. It is, however, the perceived use of the substitution mechanism for electioneering purposes that is likely to raise most concerns. Many of the main political parties have installed new faces into elected office in a bid to raise a fledgling politician's profile ahead of fresh elections. However, given the three year cycle of Council, European, Assembly and Westminster elections, substitutions are likely to persist and they have also had impact on local councils. For example, in the 17 months following the April 2014 council elections, 13 substitutions were made at local government level. Some of these were the result of representatives (Máirtín Ó Muilleoir, Adrian Cochrane-Watson, Gary Middleton, Gavin Robinson, Claire Hanna,) moving to the Assembly or Westminster. To view all council substitutions since 2014 election, Click here. The Electoral Office estimates the cost of an Assembly by-election to be between £175,000 and £215,000, while the cost of a council by-election would have to be covered by the council – thus putting considerable financial burden on ratepayers. What’s more, the fact both the Assembly and councils operate by way of multi-seat electoral areas means that the outcome of a by-election for a single seat heavily favours the area’s strongest party. For these reasons election analyst Nicholas Whyte believes the mechanism represents the “least worst option” for the electorate due to voter apathy and inbuilt difficulties with running a by-election in a multi-seat constituency. “In my view there isn't a perfect solution,” said Mr Whyte, Visiting Professor at Ulster University's Faculty of Social Science . “Obviously if a vacancy turns up a party is most likely to turn to someone who previously showed an interest. “By-elections are expensive, not supported by the electorate in terms of turnout, and distort the electoral representation in that smaller parties are less likely to win them. “Co-option by councillors, which was an option under the old rules was equally a political tool that served majorities better than minorities. Nomination by party leaders is in some ways the least worst option - at least in that case the electoral balance of the previous election is preserved, in numbers if not in person. According to the Electoral Office (EONI) the current substitution/nomination process, which allows parties to replace representatives at Stormont and on Councils without a by-election, came into effect on April 1, 2010. Since the legislation came into effect this has not happened. As such the party, under whose banner a representative wins a seat, appears to ‘own’ it for the duration of the electoral term – with one significant exception. An MLA or councillor can change party and retain their seat – in the Assembly this was exemplified by the defection of UUP MLAs Basil McCrea and John McCallister (to set up NI21) and David McNarry (to join UKIP). Mr McCallister later left NI21 to serve as an Independent. Another example was in December 2012 when Adam Harbinson, a substitute Alliance councillor on the old North Down council switched allegiance to the DUP months after being appointed. However, whilst a sitting candidate is free to change party, if they later step down EONI states that control of the seat reverts to the original grouping. “If a vacancy arises, the request for a nominee will go to the nominating officer of the party for which the seat was elected regardless of the member changing party designation,” EONI stated. In addition to the turnover of political representatives, the current Assembly term has also seen major changes in the make-up of the Executive, with at least 16 changes in personnel since May 2011. Just five of the 15 Executive seats have been held by the same representative for the entire duration of the current Assembly term which began in May 2011. The biggest changes have come in the key departments of finance (DFP) and health (DHSSPS), where three DUP representatives have held each position, while the UUP’s withdrawal from the Executive also saw a shift in the party holding the regional development brief. In September this year Arlene Foster temporarily took on the role of acting-First Minister as part of her party’s ‘in-out’ strategy around the latest Stormont talks. But following Peter Robinson's recent resignation announcement, his First Minister's post will have to be filled again. The role of deputy First Minister also briefly saw change, when John O’Dowd stood in for Martin McGuinness during the 2011 Irish Presidential election campaign. The Alliance Party, who hold the DEL and DoJ ministries, was the only party not to change its Executive members. Substitute MLAs have been appointed in 12 of the 18 Assembly constituencies, with four of the current six south Belfast Assembly members unelected. The Detail Data journalism project, which gathered the figures, notes that legislation introduced in 2010 allows parties to replace outgoing members with a replacement politician of their choice – in a process that the public has no official means of objecting to. The substitution mechanism aims to eliminate arguments caused by the old co-option system and to eradicate by-election costs estimated at up to £215,000 per poll. In the current Assembly term 14 members have left Stormont in favour of seats in Westminster, Brussels or local councils. Ill health has also been cited as the rationale for a number of other substitutions. According to election analyst Nicholas Whyte the current scenario represents the “least worst option” for the electorate, even though some of the changes have caused public controversy. But in addition to MLA replacements there have been major shifts in who sits at the Executive table, with repeated ministerial changes raising questions over continuity of leadership in departments. Only five of the 15 ministerial and junior ministerial seats have been occupied by the same representative for the complete duration of the Assembly term that began in May 2011. The key departments of health and finance have seen three ministers each in the current Assembly term, while enterprise, environment, social development, regional development and the two junior ministries have also seen changes. Both Peter Robinson and Martin McGuinness have temporarily stepped down from their positions in the current term – Mr Robinson during the DUP’s in-out strategy and Mr McGuinness during his Irish presidential candidacy. As such, only the departments of agriculture, culture, education, employment & learning and justice have had the same minister at the helm for the duration of the current term.